Name of the Company - Triveni Turbine Limited. The Company carries out its business directly and through its subsidiary companies, including through their network of offices. The Company operates in the following locations through its foreign subsidiaries and their network of offices. The manufacturing facilities are situated in Peenya&Sompura, both in the state of Karnataka and its corporate and registered office is situated in Noida, UP. Further, it has Sales and Service offices at Noida, Naini, Mumbai, Pune, Kolkata, and Hyderabad. These offices serve customers in domestic market in their respective territories. Please refer to “Presence across markets” section of Company’s Annual Report for the financial year 2017-18 for complete list of markets served. Section B: Financial Details of the Company? The Company has spent an amount of ₹ 30.92 million during the financial year 2017-18 which amounts to 2% of averagenet profit before tax for previous three years on standalone basis.Thus the total CSR spent for the year 2017-18 is 3.15% of Profit After Tax for the year. The CSR Committee of the Company deliberates and finalizes various CSR proposals as per Company’s CSR policy and recommends such proposals to the Board for approval. The Committee also periodically reviews and monitor the progress of all approved CSR projects. Additionally, during financial year 2017-18, the Joint Venture Company, GE Triveni Ltd, Bengaluru has spent ₹ 2.04 million for CSR activities as per its obligations despite incurring a loss in the current year. Does the Company have any Subsidiary Company/ Companies? Yes, the Company has awholly owned foreign subsidiary, two foreign step down subsidiaries and a Joint Venture Company in India. Do the Subsidiary Company/Companies participate in the BR Initiatives of the parent company? If yes, then indicate the number of such subsidiary company(s). There are no formalized arrangements but in respect of most of the issues relating to business responsibility, the values, policies and thinking of the parent company are practiced in the normal conduct of the business by the subsidiary companies. Do any other entity/entities (e.g. suppliers, distributors etc.) that the Company does business with, participate in the BR initiatives of the Company? The Company does not mandate its suppliers to follow its BR initiatives but they are explained about such initiative and are encouraged to adopt such initiatives. There are quite a few large suppliers and other business partners which pursue their own BR initiatives. If yes, then indicate the percentage of such entity/ entities? [ Less than 30%, 30-60%, More than 60%]. The BR initiatives are informally led by the Executive Director under guidance of the CSR Committee and under overall supervision of Board of Directors. P1 Business should conduct and govern themselves with ethics, Transparency and Accountability. P2 Businesses should provide goods and services that are safe and contribute to sustainability throughout their life cycle. P3 Businesses should provide goods and services that are safe and contribute to sustainability throughout their life cycle. P4 Businesses should respect the interests of, and be responsive towards all stakeholders, especially those who are disadvantaged, vulnerable and marginalized. P6 Business should respect, protect, and make efforts to restore the environment. P7 Businesses, when engaged in influencing public and regulatory policy, should do so in a responsible manner. P8 Businesses should support inclusive growth and equitable development. P9 Businesses should engage with and provide value to their customers and consumers in a responsible manner. 1 Do you have policy/policies for BR Yes. The Company has policy for Business Responsibility. Besides, the Company has formulated policies and standard operating procedure (SOP) to provide clarity to its personnel at various operating level. 2 Has the policy being formulated in consultation with the relevant stakeholder? The Company has formulated the policies, SOPs and adopted best practices by considering inputs, feedback and sensitivities of the stake holders, wherever practicable. 5 Does the Company have a specified committee of the Board/Director/Official to oversee the implementation of the policy? The BR initiatives are informally led by the ExecutiveDirector under guidance of CSR Committee and overall supervision of the Board of Directors. 7 Has the policy been formally communicated to all relevant internal and external stakeholders? The internal stakeholders have been made aware of the policies. SOPs are distributed to all HODs for wide circulation. External Stakeholders are communicated to the extent applicable and relevant. The mandatory policies are also updated on the website of the Company. 9 Does the Company have a grievanceredressal mechanism related to the policy/policies to address stakeholders’ grievances related to the policy/ policies? The Company has an effective system of recording comments/ complaints of the stake holders and relating to above policies and there is a time bound approach to resolve such complaints in a fair manner. 10 Has the Company carried out independent audit/ evaluation of the working of this policy by an internal or external agency? Apart from self-certification, discussions in meetings of crossfunctional teams, certain areas related to EHS, customer satisfaction and quality are subject to internal audit by independent third party agencies and domain expert consultants. The compliance is also evaluated during the process of certification of various international quality standards. The spending and controls of corporate social responsibility are audited by statutory auditors. Indicate the frequency with which the Board of Directors, Committee of the Board or CEO to assess the BR performance of the Company. Within 3 months, 3-6 months, annually, more than I year. The Vice Chairman and Managing Director and Executive Director review and assess the BR performance of the Company at least once a year. Other senior officers of the Company review them more frequently. Does the Company publish a BR or a Sustainability Report? What is the hyperlink for viewing this report? How frequently it is published? This is the Second Business Responsibility Report relating to the financial year 2017-18 which forms part of the Company’s annual report for the financial year 2017-18. The annual report containing this Business Responsibility Report will be put up on the web site of the Company at www.triveniturbines.com. The Company publish BR report once a year. The report is also hosted in share point platform which enables employees of the Company to view the report. The Company’s commitment to ethical and lawful business conduct is a fundamental shared value of the Board of Directors, senior management and all employees of the Company and its subsidiaries. The Corporate Governance philosophy of the Company is anchored on the values of integrity, transparency, building efficient and sustainable environment, system and practices to ensure accountability, transparency, fairness in all the transactions in the widest sense to meet stakeholders and societal expectations. The Code of Conduct and other policies adopted by the Company apply to the employees of the Company. In addition, the Company has a Whistle Blower Policy through which the Company seeks to provide a mechanism to the employees and directors to disclose any unethical and/or improper practice(s) suspected to be taking place in the Company for appropriate action and reporting. Further, no employee is denied access to the Audit Committee and all disclosures, non-compliances if any, are reported to the Chairman of the Audit Committee. The Code of Conduct and Whistle Blower Policy are uploaded on the Company’s website- www.triveniturbines.com. Does the Policy relating to ethics, bribery and corruption cover only the Company? Does it extend to the Group / Joint Ventures / Suppliers/ Contractors / Others? In respect of most of the aforesaid issues, the values, policies and thinking of the parent company are also practiced in the normal conduct of the business by the subsidiary / joint venture companies. GE Triveni Ltd, one of the subsidiary companies, has framed its own policies in this regard. The Company also encourages its suppliers and contractors to adopt such practices and follow the concept of being a responsible business entity. How many stakeholders’ complaints have been received in the past financial year and what percentage was satisfactorily resolved by the management? If so, provide details thereof. In the course of business, the Company has received queries from shareholders (07) during the year, which were all resolved during the year. Further, 50 nos. Customer queries/ complaints were received during the year relating to functionality and quality of the steam turbines of which 93% were resolved satisfactorily and balance are under process of closure. With a view to achieve maximum customer satisfaction, the Company gives utmost importance to resolve such inputs and absorbs the learning in the system and processes to avoid recurrence. Other than the aforesaid, the Company did not receive any major complaints and none of the major complaints is outstanding at the end of the year. The Company manufactures Steam turbines, spare parts and provides services relating thereto, including refurbishment of steam turbines of other makes. The products supplied by the Company are environmental friendly and help industries to lower costs through cost competitive generation of power for captive consumption and/or for external sale. The Company supports environment sustainability with significant focus on thermal efficiency improvements to meet key customer expectations. The Steam Turbines supplied in power plants are run on non-fossil fuels like sugarcane bagasse, biomass, municipal waste and waste heat from process plants and gas turbines. The Company has awell-equipped Research and Development department which is engaged in continually developing highly efficient turbines keeping in view the social and environmentalconcerns. The Company has introduced Hybrid (Reaction –Impulse) design which combines the unique advantages of both reaction and impulse technologies for fuel efficiency, robustness and compactness.The customers are benefitted in terms of less fuel consumption, automated turbine control system, high density turbine with lower foot print withsame power output. Keeping in view the scarcity and cost of fossil fuel the Company has designed Turbine solutions for energy efficient district heating plants, to generate Combined Heat and Power using Biomass fuel. District Heating System distributes thermal energy from a central source to residential, commercial and industrial consumers for use in space heating, water heating and process heating. The Company offers steam turbines that can help industries produce clean energy solutions from waste heat from industrial equipment’s like boilers, furnaces, process heaters among others. Waste heat recovery improve energy efficiency and recovering waste heat losses provides an attractive opportunity for an emission free and less costly energy resource. FOR EACH SUCH PRODUCT provide the following details in respect of resource use (energy, water, raw material etc) per unit of product (Optional). Reduction during sourcing/ production/ distribution achieved since the previous year throughout the value chain? Reduction during usage by consumers (energy, water) has been achieved since the previous year? The Company is continually engaged in upgradation of its products to bring about energy conservation to optimize the resource use. Further, it is involved in reducing wastages/ rejections during the manufacturing process (including that of its suppliers & subcontractors) and value engineering activities with a view to reduce costs of products and be competitive, without compromising in any manner on the quality and benchmark efficiencies. The Company has installed roof top Solar PV Power Panels as part of the ambitious goal of sourcing 15% electricity from renewable source. The installed plant is 300 KW solar photovoltaic (PV) plant in the factory capable of generating 0.38 million units annually which reduced the carbon footprints of 392.008 tonnes during the year 2017-18, resulted in net saving of about ₹ 3.0 million in electricity charges. In addition, CFL lamps in the office and meeting rooms of the administration building, Training Centre Building have been replaced with energy efficient LED lamps which has resulted in significant power saving. Does the Company have procedures in place for sustainable sourcing (including transportation)? IF yes, what percentage of your inputs was sourced sustainably? Yes. The Company is increasingly building its capabilities for effective sustainable sourcing. The company understands the growing expectations of stakeholders (including customers, shareholders, employees, NGOs, trade associations, labor unions, government agencies, etc.) to take responsibility for their supplier’s environmental, social and ethical practices. Accordingly, company is increasingly making responsible sourcing an integral part of procurement and supply chain management processes and managing these risks in the supply chain. Though it is difficult to quantify exactly in terms of percentage of inputs that was sourced sustainably, the Company is increasingly focused on sustainable sourcing and it is on rise. Has the Company taken any steps to procure goods and services from local and small producers, including communities surrounding their place of work? If yes, what steps have been taken to improve their capacity and capability of local and small vendors? Yes, the Company encourages highly skilled willing retired employees to develop small or micro companies, around its vicinity, for supply of components to the Company and provide related services. Further, the Company also develops several job workers locally, mostly small producers, for sourcing components. The Company imparts necessary training and engineering skills to the local job workers for their development and ensures sustainable quality deliverables. During the year the Company has procured above 60% of total procurement in terms of value from local sources, where local source is defined as at the State in which the manufacturing plant is established. The Company also believes in long term partnership with the vendors by having rate contracts with them and providing periodical feedback on their performances in terms of quality, delivery, services, environmental health and safety, which helps the vendors to improve their performance by taking corrective actions on the parameters where they are found lacking. Transparency and fair approach are maintained while dealing with the vendors during the entire procurement cycle. Yes, the Company have a mechanism to recycle products and waste. Lubricating oil is recycled using centrifuge filtering process to remove suspended solids and impurities. About 85% to 88% lubricating oil is recovered and reused by this process. Further the waste steel raw-materials arising out of the manufacturing process are sent back to the foundries from where the Company sources the castings. The Company thus ensures almost 100% recycle of steel waste during production with negligible waste. Please indicate the number of complaints relating to child labour, forced labour, involuntary labour, sexual harassment in the last financial year and pending, as on the end of the financial year. There wereno such complaints during the year. What percentage of your under mentioned employees were given safety & skill up-gradation training in the last year? Has the Company mapped its internal and external stakeholders? Yes, the key stakeholders of the Company are employees, customers, government authorities, suppliers & Contractors, charitable organizations, trade & chamber associations, shareholders and society. Out of the above, has the Company identified the disadvantaged, vulnerable & marginalized stakeholders? For the Company all the stakeholders are equally significant. However, the Company encourages to associate and develop small and micro suppliers and job workers and assist them to provide requisite engineering skill and access to resources. In addition, the Company engages in various CSR activities, mostly for vulnerable and marginalized stakeholders. As a part of the CSR initiatives of the Company, considerable importance is given to disadvantage, vulnerable and marginalized stakeholders – Please refer to Annexure E of the Director’s Report. Does the policy of the Company on human rights cover only the Company or extend to the Group/ Joint Ventures/ Suppliers/ Contractors/ Others? The Company has the Human Rights Policy which is primarily applicable to the Company. However, the Company encourages its Joint Ventures, suppliers, contractors and other stake holders to follow its Human Rights Policy and engages with them to elaborate the salient points. How many stakeholders’ complaints have been received in the past financial year and what percent was satisfactorily resolved by the management? During FY 2017-18, the Company has not received any complaints pertaining to human rights from any stakeholder. Does the Policy related to Principle 6 cover only the Company or extend to the Group/ Joint Ventures/ Suppliers/ Contractors/ Others. The Company’s Policy on Safety, Health & Environment extend, to the extent practicable, to its subsidiaries, Joint Venture, Suppliers and Contractors as well. Under Company’s various “Green initiatives”, the Company’s manufacturing plants have more than 2500 trees, zero discharge facility with 100% waste water getting treated and used for gardening along with Kitchen Waste Compost unit. The employees of the Company and its vendors are encouraged to do tree planting in their respective houses, vicinity and factories by free distribution of saplings. Yes, it is the endeavor of the Company to continually evaluate and subject its processes to stringent scrutiny to minimize the impact of its manufacturing operations on the environment. Further, the same philosophy is practiced in the development of new products, the objective of which is to improve thermal efficiency levels, use renewable energy and be involved in projects linked to green power. Does the Company have any Project related to clean development mechanism? If yes, whether any environmental compliance report is filed. No, the Company is not directly associated with any project related to clean development mechanism (CDM). However, in view of its product being environment friendly and related to renewable energy, it must have supplied its products to CDM projects, the details of which are not available with the Company. At present, under Clean Development Mechanism, the Company is working with Indian Green Building Council (IGBC) pioneer in green building movement for its manufacturing facilities. The Company has applied for “Platinum Green building certification” and hence continues to demonstrate Company’s commitment to green buildings. Has the Company undertaken any other initiatives on clean technology, energy efficiency, renewable energy, etc. The Company currently sources 15% of its electricity from renewables. Energy Conservations measures have been implemented at all the plants and offices of the Company and special efforts are being put on undertaking specific energy conservation projects. 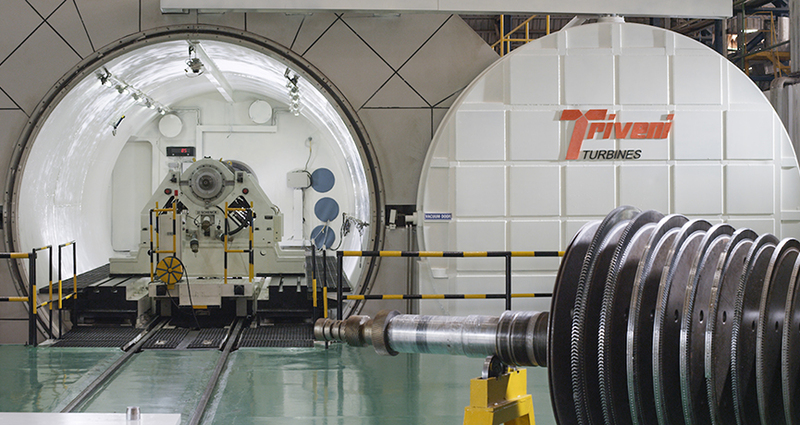 Most importantly, the steam turbines manufactured by the Company largely operate on non-fossil fuel, renewable in nature, to meet the steam and power requirements of its customers. The Peenya plant generates 300 KW using solar power which meets 30% of our total consumption. The Company has similar plans for its new facility in Sompura which will be implemented in due course. Are the Emissions/ Waste generated by the Company within the permissible limits given by CPCB/ SPCB for the financial year being reported? Yes, the Emissions / waste generated by the Company are within the permissible limits given by Central Pollution Control Board (“CPCB”) / State Pollution Control Board (“SPCB”). Number of show cause / legal notices received from CPCB/ SPCB which are pending (ie not resolved to satisfaction) as on end of financial year. No such notices were received during the year or pending at the end of the financial year. Have you advocated / lobbied through above associations for the advancement or improvement of public good? Yes/ No if yes specify the broad areas. The Company approaches from time to time with various organization, namely, CII, FICCI for improvement of various economic and social policies for sustainable growth in the value chain. Does the Company have specified programs / initiatives/ projects in pursuit of the Policy related to Principle 8? Yes, the details are forming part of the CSR Report – Annexure-E to the Director’s Report. This is in addition to the Company’s efforts to support small and micro suppliers and job workers. Are the Programs/ Projects undertaken through in house team / own foundation/ external NGO/ Government structures / any other organization? The Company’s social projects are carried on under its CSR Policy for community welfare, providing education for employment opportunities and rural development. Collaborative partnerships are formed with external implementation agencies having requisite competence. Have you done any impact assessment of your initiatives? Yes, for each of the CSR project undertaken, impact analysis is carried out by external implementation agency along with in-house CSR team. All such assessments are carried out after completion of the project. What is your Company’s direct contribution to community development projects – amount in INR and the details of the project undertaken? The Company has made incurred CSR expenditure amounting to ₹ 30.92million during the financial year. Additionally, a subsidiary of the Company has incurred ₹ 2.04 million towards CSR activities. Please refer to Annexure -E of the Director’s Report for details..
Have you taken steps to ensure that this community development initiative is successfully adopted by the Community? Yes, the CSR activities were pursued in line with the Company’s policy and framework. The first step in the process is to identify target class of the communitythat requires intervention.The Company continuously monitors community development initiatives through various parameters such as health indicators, literacy levels, sustainable livelihood processes, population data and state of infrastructure among others. From the data generated, rolling plans are developed for short to medium term. The projects are assessed under the agreed strategy and are monitored on a quarterly basis. Wherever necessary, mid-course corrections are carried out. As on March 31, 2018 9% of customer complaints are pending. Does the Company display product information on the product label, over and above what is mandated as per local laws? The Company displays product information as mandated by Bureau of Indian Standards. Did your Company carry out any consumer survey/ consumer satisfaction trends? The Company has a well-established system in place for dealing with customer feedback through “Customer Complain Resolution System” (CCRS). This is headed by a senior officer. A periodic MIS is circulated to senior management and concerned stakeholder depicting the customer satisfaction trend. Customer engagement processes have been aligned across the value chain to monitor customer satisfaction and feedback. Customers are provided multiple options to connect with the Company through email, telephone, website, feedback forms etc. The Company also has a dedicated customer care response cell to address customer queries and feedback on product.